I'm at the stage where I am going to go to the dealer to discuss ordering a new (2019) Z06. I live in Canada (Northern Ontario) and the car I want has a MSRP of $114,000 plus tax delivery etc. The dealer casually already advised me that some dealers are selling Vettes over retail, but told me he could likely go $3,000 below retail because of my loyalty. I've been a customer for over 30 years ordering high end new cars from this dealership with the last three being fully loaded Cadillac's, those in the last thirteen years. Is he correct that dealerships are selling them over retail? Most importantly what type of discount if any should I expect on that car? 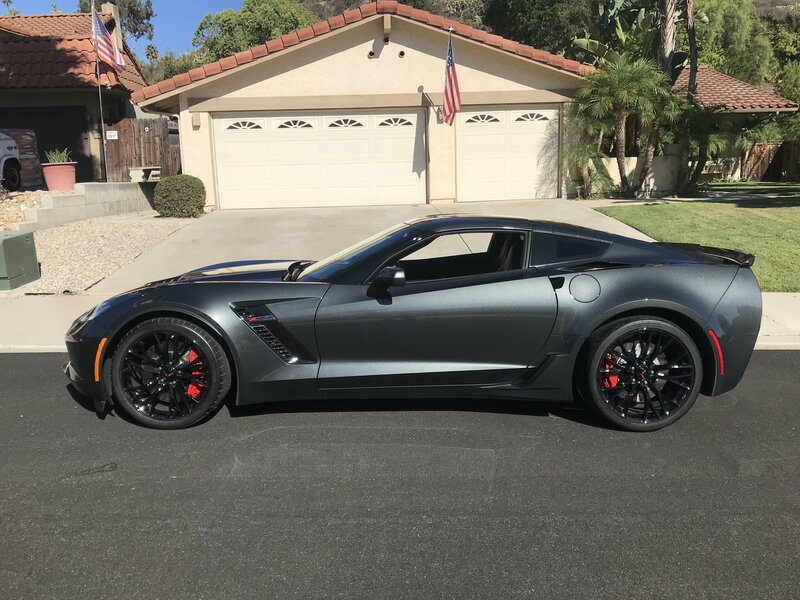 I have never heard of a dealer selling the 19 Z06's over retail. I just bought my 2019 for several thousand under MSRP. Criswell is discounting Z06's as well. Not sure how the Canadian dealerships are discounting. Last edited by Thunder22; 09-24-2018 at 10:47 AM. Cobra--pure BS. No dealer mark ups on a Z06 and if anyone tells you that keep walking. Some advice from a fellow Canadian--given the driving season is nearing it's end, just wait. Try to find a 2018 on the lot that you like in late December and you should have no issues getting somewhere between 13-15% off MRSP along with favourable financing terms like 0%. Park and enjoy in the spring. Last edited by lupicon; 09-23-2018 at 08:34 PM. Got my 2019 Z06 with 10% discount. I got 11% from a local dealer on an ordered 2019 Z06/Z07 in April. You should get more for an in-stock model in September. It should be at invoice price the most which is about 10% off msrp. just got my 2019 z06z07 m7 factory ordered 1500 under invoice not msrp.. msrp was 105k I got it for 94k. Thank you to all for sharing your purchasing experiences. I feel now that I'm fully prepared to negotiate. I hope my next post is to advise that I've ordered my new LBR Z06. Good Luck. Ordered my 2019 LBR Z06 2LZ August 28th. 10% under MSRP. Have a TPW of 10/8/18. Waiting stinks!!!! looks like you should have stopped giving this dirtbag your business 25 years ago my man. I think he's stuck buying in Canada if he wants a new Corvette. New car dealers cannot sell to other countries. Violates their franchise agreement. Update, I'm right in the middle of negotiating the final details on a new 2019.........the dealer provided me a price which was actually extremely attractive. I accepted the offer, and I have an appointment Thursday evening to finalize the deal, so technically I can't say I've ordered a new Vette, but I hope to be able to say that I've ordered my new "LBR" Z06 Thursday evening. The dealer told me that ordering a Z06 in Northern Ontario is not like ordering other cars. I've ordered my last five cars from GM and enjoy the "build" experience and they usually arrive in 6-8 weeks. The dealer advised me that when they ship a Corvette that the whole car is wrapped for protection and that due to our winters that they don't ship/deliver in the winter and he said, even though the order will be placed on Thursday, he advised don't expect it to even be built until after February. He also described ordering Z06's something like a lottery. I've been with this sales manager since the mid 80's and I thoroughly trust his and the dealers integrity. The MSRP on my car is north of $117,000 and he told me they don't even need a deposit from me, but I want to put one down to obtain a bill of sale as I'm hopeful that that will assure me of getting this car. Are Z06's limited to the point that there is a potential risk that even if I order the car that GM might not fill the order? it's true about not delivering in the winter but it's not true what he said about z06s. I ordered mine from the dealer in guelph I mentioned with no issues and he's got stock of z06s including a LBR or at least he did when I went there for oil.change earlier in the week. He also delivers the cars to anywhere in Ontario. Seriously try giving Al Hinds a call. Tell him Jacek sent you and he will give you an even bigger discount as he does with all the vettes he sold to my friends. That guy has been screwing you for 13years, now he wants to make it 14. Dont buy from that dealer go somewhere else, unless you get the biggest discount there!!! Seriously...ive worked in the business and still do somewhat. Thank you for your assistance but I am committed now that I have accepted this dealers quote. When I first mentioned to this sales manager (my current Cadillac was in for scheduled servicing) that I was interested in a Vette a couple of months ago and we briefly discussed pricing I think he understandably didn't take me seriously because I have been telling him for years that I wanted to buy one, but when it became clear that I wanted an actual hard quote he gave me a remarkable price. As well prior to getting this quote I called another dealer out of town who I ordered my former 2010 Cadillac from and he also gave me a similar great price (actually slightly better). (In 2009 GM went through restructuring and for a six month period we did not have a local Cadillac dealer, so I dealt with this out of town dealer-the salesman even remembered me). So I have a question, with GM not shipping Vettes in winter months here in Northern Ontario, if my order goes in this Thursday as it should, what can I expect to happen then behind the scenes? Would it simply be that when it comes time to build Z06's, that my car will be built at that time and then simply be stored somewhere until weather permits shipping? Cobra--Did you get the Z07 package with the SC2's. If so, do not move the car in sub zero temperatures--they will crack. i did not opt for the Z07 package, but I loaded it up with pretty much everything else, 3LZ package including chrome wheels, competition seats, transparent roof and the CAI option to mention a few. Interestingly the dealer told me that one of the reasons that they don't ship in the winter was because the tires will crack, however I only ordered the base tire and not the SC2's.